My name is Glenda Evans Hood and I was born in Orlando, Florida on March 10, 1950. I was born at the Orlando hospital which was called Orange Memorial Hospital on Orange Avenue. It was an old brick building and, I think, at the time when our mothers went in to have their children they stayed about a week long. So nowadays, it’s in and out obviously, and we have a beautiful new hospital facility. But Orange Memorial Hospital, I’m still attached to that same hospital system and had all my children at the same hospital. So it’s kind of fun to have that memory. 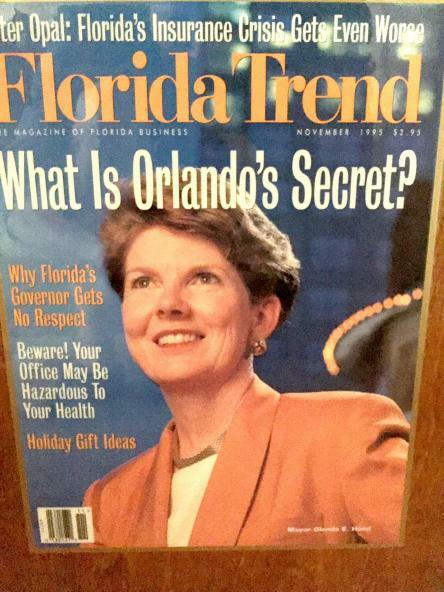 The Honorable Glenda Evans Hood featured on the cover of Florida Trend, November 1995. I grew up on Big Lake Conway in south Orlando. I was on the west side of Big Lake Conway. So before I got my driver’s license I was always in a boat out on the lake and lots of my friends lived on the three Lake Conway’s so we’d go between each other’s homes by boat. Did lots of water skiing of course, lots of fishing. And it was a wonderful time growing up in the fifties and sixties when you would, you know, on the days you weren’t in school, you would just leave your house at 8 o’clock in the morning and go out on the lake with your friends wandering through the orange groves because there were lots of orange groves in the area still at the time. And your parents wouldn’t see you until six o’clock at night when my dad rang that big iron bell calling me back home for dinner that my mom had prepared. Glenda Evans on WDBO’s “Uncle Walt Show” with Walt Sickles. My mother and father and my grandparents lived out in the Lake Conway area in what is now Belle Isle. And so it was nice to have grandparents across the street. Unfortunately, my Grandfather Glenn Bowstead, who I was named after, died when I was two years old. And so, my grandmother was there and she was always kind of my refuge, you know, if my mom and I had a little discussion that wasn’t quite so pleasant, I’d run across the street to my grandmother’s house…. I went to Cathedral School in downtown Orlando, the Episcopal School on Lake Eola… the old buildings they were our classrooms. We didn’t have a lot of recreation facilities because we were kind of limited by land area. So my playground in elementary school was really Lake Eola Park. And so, we would walk across the street with our class and, you know, play tag or whatever over in Lake Eola Park. After I went to Cathedral School, I went to Pine Castle Elementary. I went to finish up my elementary school years and so I would walk to school from my house or I could ride my bicycle. And boy, that was a great thing to do because you felt so independent to just leave your house by your self in the morning or meet up with friends and ride your bicycle to school and then be able to ride home in the afternoon with a little stop at McCall’s Drug Store in what is now downtown Pine Castle. And the building is still there, but, of course, it’s changed a lot. It’s more of a thoroughfare than a little community like it used to be. There was Darden’s 5 and 10 where we’d go and spend our nickels and dimes and quarters to get fun little toys or go to McCall’s Drugstore and get a malted milk or a shake or a Coke or something before we went home. So that was fun. I went to Oakridge Junior and Senior High Schools. We didn’t have middle schools at the time. We had junior and senior high schools. At that point in our Orange County Public School history they were building combination junior and senior high schools. And so, Oakridge was a brand new school and I was there through 12th grade. And so, there were a lot of things that happened during those years. It was a time when the schools became integrated. It was a time when we had teachers go on strike. And so, as young people we learned a lot about things outside our community; issues that were really important to us. And so, I think that made a big impression on me and a big impact on me for the rest of my life. I had lots of friends certainly at Oakridge, but I had a lot of friends all over Orlando because my mom and dad had a business in downtown Orlando. My dad took over Grandfather Bowstead’s camera shop. My Grandfather Bowstead’s hobby was photography and so when he and my maternal grandmother moved from Chicago to Orlando with my mom back in the late twenties, early thirties, he opened a camera shop as a hobby in downtown Orlando. And it was kind of one of those places where people would come and sit and talk about their hobby of photography. And while I don’t remember my grandfather because as I said he died when I was two or three years old, I do remember lots of fun times at the camera shop. 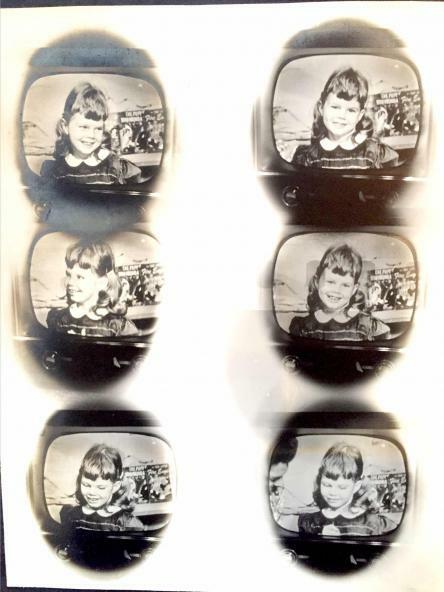 Because when my mom and dad took over the business, I spent lots of time there with my mother when she would pick me up at Cathedral School, I’d go sit at the camera shop. And so, I met lots of people and a lot of the people I met were parents of friends that I had from all over the community. 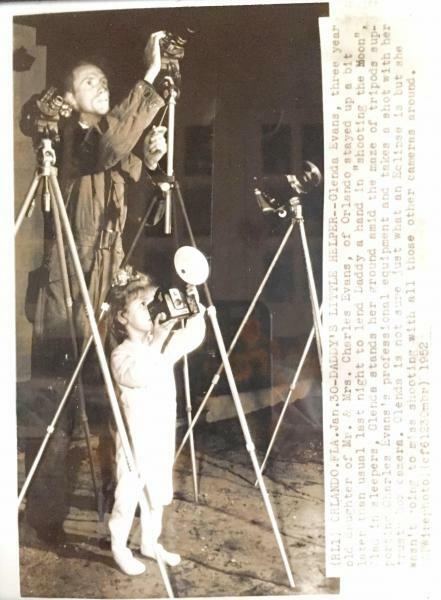 Glenda Evans, age 3, with her father, Charles Evans, photographing the eclipse in this 1952 photo. And then when I was in high school, I would go and work in the camera shop. So I would work there on Saturdays or on holidays and it taught me about business. It taught me about retail business. And also it really taught me a lot of skill sets as far as how you get along with people; how you negotiate with people and the like. So I appreciate that. I do remember some fun stories when I would work at the camera shop. Often my dad would ask me to go get lunch and so halfway down the block, he was up on north Orange Avenue, and there was kind of a cluster of businesses there: WDBO Radio, Sanderson’s Nursery, Skein’s Flower Shop, Bowstead’s Camera Shop. And just down the street and across the railroad tracks was the bus station and it was run by Bo Swope and it was called Orlando Transit, I believe that was it. And there was, right next to the railroad track, there was this little tiny building and it was a cafe. And it was run by Milly. And Milly used to scare me when I would go in there because Milly didn’t have any teeth, but she was the nicest lady you would ever meet. And all the bus drivers were in there getting their lunch or on their break. And here I was little Glenda at twelve or ten years old going in there to pick up the sandwiches for my dad or my mom back at the camera shop. So it was kind of a fun memory to have. And all the bus drivers would look at me because I had bright red hair. “Hey Red, how you doing today?” And they knew me so that was kind of fun. And I also remember going in the back of the camera shop. I used to love to go in the back where all the inventory was kept. My dad rented movies as well. And, of course, they were the big reels with the film on it. So he would rent those because we didn’t have everything we have today. And there weren’t movies shown on television. I mean, we barely had TV at the time. And so, I used to go back and I’d look at all the titles and the cartoons and the different news reel titles and that seemed like a fun thing for me as well. So anyway, I grew up in a retail business family. And my grandfather who I wish I had known, Glenn Bowstead, he also had another hobby besides photography and he raised Boxer dogs and showed them in dog shows all over the country. And so while my mother was going to Rollins College, she helped with raising the dogs in the kennels and the kennels were out in the orange groves next to my grandmother’s and grandfather’s house out there in Belle Isle, Lake Conway area. So I grew up with Boxer dogs, and ones that were shown in dog shows and won trophies and ribbons all over the country. So that was kind of fun as well. My grandmother was probably the sweetest woman ever and just my best friend; and really the only grandparent I knew. And on those weekends growing up we would often catch the bus up at the end of our block and go into downtown Orlando and we would go to the Beacham Theater to a movie. We’d go to Morrison’s Cafeteria for lunch and that was fun pushing your tray along and being able to pick whatever you wanted in the line there at Morrison’s. And going to all the different five and dime stores whether it was Kress, whether it was Woolworth’s stores. And then there was a vibrant business community, small businesses downtown and department stores. Ivey’s department stores and Dickson & Ives and all the little stores and there was Federal Bakery where we’d always get treats and take those back home when we rode the bus back home. And one thing I remember, when we’d go to downtown we’d dress up. Nowadays, everything’s very casual and we kind of dress casually wherever we go and whenever we travel whether it’s a short distance or long distance. But in those days, you would dress up. So we would dress up to go downtown. And then if you were really going to do something special, we would go to downtown for dinner and we’d go to the dining room at the San Juan Hotel. Or when my godparents would come from out of town to visit, they would stay at the old Orange Court for weeks at a time. And so, all of those wonderful places bring back wonderful memories for me. Now when I was at Cathedral School one of the things that I really loved doing was coming to the library. Because it was just pretty much catty-corner in the next block. And so, the wonderful old Albertson Public Library sat there on the corner and the Children’s section was downstairs and so we wouldn’t have to go in the door and go up the stairs and go through the doors into the big library and go downstairs from inside. We could go down a special little stairway outside from the sidewalk and go into the Children’s Department. And so, we would do that. And I was never going to miss any of those book club or reading club opportunities. I was going to get all my stickers and read all those books that they asked us to read. So it was great fun and again great memories of downtown. And, you know, we had beautiful old buildings and wonderful gathering spots downtown. And while some of those are gone, we have new ones. You know, that’s part of the growth of a city where things change and things grow, but some things don’t change like Eola Park. Another thing we would do growing up because we didn’t have theme parks; we didn’t go to the movies very often, you had to find your own entertainment so to speak. So my parents would put my brother and me in the car in our pajamas in the evening, and we’d go park next to Lake Eola and we would watch the fountain change colors. And that was our entertainment. And I bet a lot of people who grew up in Orlando have that same memory. I know my husband does. He’s one of six children and he said they would put all six children in the car and go down there and watch the fountain change colors. So I was so pleased a few years ago when we were able to repair the fountain and able to see it change colors again. I graduated from Oakridge High School and I was involved in a lot of things in high school: in Student Council, I was a cheerleader, Honor Society, just always wanted to learn by being involved with things and I love people. And so, it was fun to work on different projects or support your school in some way through these different things. You know, often I don’t talk about being a cheerleader, but at the time there weren’t athletics for girls. There were not sports that girls would participate in so that was kind of our athletics or our sports. Plus it was a great way to show support for your school and a lot of fun as well and you got good exercise to boot. After high school some of the friends that I had were going to different colleges out of state, and, of course, a lot of friends were going in state, but I kind of wanted to spread my wings. And so, I went my first two years of college to Queen’s College in Charlotte, North Carolina. It was an all women’s school and I had a couple friends that were there that had been there that were a year older. So it was nice to know somebody there. But not only was it a great experience to be able to go out of state to school – that’s where I saw snow for the first time and ice and all the things about cold weather which we didn’t have in Florida- but I really learned how to work in a community and how to work in a community of women by going to an all women’s college. And I’m very grateful for that because you’re in a nonthreatening environment. And, you know, there’s lots of studies that have been done that show women that go into leadership positions in their communities, or at the state and national level or whatever way, at some point in time in their life have been in an environment where it’s been that nonthreatening one with all women. And so, I was very grateful for that. How did you decide on your college major? I had one professor that really influenced me, she was my Spanish language professor. And I decided that I wanted to major in Spanish. And I had taken Spanish all throughout high school and junior high school and even in elementary school at Pine Castle. I had a teacher, Mrs. Aidy, who taught a little Spanish class after high school. And so, I was always interested. And we were starting to see an influx of Spanish speaking people in the Orlando area. And so, I actually, in high school I had the opportunity to get to know a lot of the new people who spoke Spanish that were coming into our community. And so, I thought that will be very helpful in whatever business I choose or knowing that I wanted to stay in Florida. Would you tell us about your studies abroad in Spain and Costa Rica? So after my sophomore year at Queens, I decided I was going to study abroad and do a junior year abroad program in a Spanish speaking country. And this one professor had been on a program through the University of San Francisco in Valencia, Spain. And so, I applied for that program and again it was very different then because you didn’t have these big catalogs of all these study abroad programs like the young people do today. You had just a handful. And so, I applied and was just accepted and I flew off to Valencia, Spain not knowing anybody and not being fluent in the language at the time and being placed with a family that spoke no English who were wonderful. There were four generations living in this family and like so many families would, they would rent a room to a student that was coming over, an American student that was coming over. So, I think, there were about twenty of us in the program from the University of San Francisco and so I was totally immersed right away. And, I can remember I would go to bed at night with a headache because, oh my gosh, I wasn’t fluent in Spanish and I tried so hard all day and most of the classes were all in Spanish as well. And they actually integrated us into the regular Spanish classes there at the University of Valencia, Spain, and then, we had a couple just with our American group. But after about three or four months, as they told me would happen, all of a sudden you didn’t have any problem. And the language came freely. You dreamed in Spanish and it was just a great experience. I had a chance to do a lot of travel while I was there as well and I had other friends who were studying in Italy, were studying in France, were studying in other parts of Spain so on holidays lots of times we would meet different places in Paris or in Rome and get to do a lot of travel. And then I realized how much I missed home. But then I also ran into, maybe it was deliberate I don’t think it was by accident, a person I had dated right at the end of my senior year of high school. And he had gone to Edgewater and was a year older than me and then he’d gone to Florida Southern College. And I said I think it was a deliberate running into and I decided I was going to stay home because I wanted to be with my family and this relationship was kind of rekindled. And I can sit here today and say I’ve been married to Charlie Hood for 46 years. So It must have been something that was meant to be. So I transferred all of my credits from the University of Valencia, Spain to Rollins College and I finished up at Rollins College in a little less than a year. So my degree is from Rollins College. So I have allegiance to three different places: to Queen’s College which is now Queen’s University of Charlotte, changed the name and it’s coed, University of Spain, and then, of course, Rollins College. One other little fact, when I was at Queens our brother university was Davidson College. And so, we had a lot of dances together and a lot of opportunities to get to know people out at Davidson because it was all men. And I was also a cheerleader at Davidson College. So I was up there not too long ago working with the Urban Land Institute on a project in little Davidson, North Carolina and I went over to the college and low and behold on the wall is a picture of our cheerleading squad from those days at Davidson College so that was kind of fun to look back on. And I only share the fact that I was a cheerleader in high school and college, because I think so many of the things I’ve done in my life are kind of being a cheerleader for your community and being supportive of your community. So it might be a funny comparison, but it’s something that I’ve thought about in recent years that I didn’t think about too much. So my husband and I married in December of 1971. We lived in a small condominium over in Lake Fairview in College Park and made wonderful friends, renewed wonderful friendships from growing up here in Orlando, of course. And I started building on many of those experiences that I had through school. People I had met, and, you know, just the emphasis, I guess, when you’re studying out of the country you realize how important it is to be an American and the freedom that we have here. And so, I really wanted to be involved in things that could emphasize that in some way. So one of the first things I got involved with was The Additions Program in Orange County Public Schools. And so, I used a couple of my skill sets. I used my Spanish because again we had more and more people coming into the community that didn’t speak English. So I taught English as a second language as a volunteer. I was at Lake Como Elementary teaching the children there. We’d go over there a couple days a week, and then I found that I also would work with some of their families in teaching them English so that was very gratifying for me. My husband’s business, his family business, was Hood Tractor Company over at Fairvilla and he started working in the family business. And there were often times where people from Central and South America would come in, they were in the agriculture equipment business. And then as the community changed, it changed also the construction business. But there were often times when people would come in that didn’t speak English or didn’t have a good command of the English language. So low and behold, I would come in translating for my husband and some of his customers when they would come in. So I realized how our community was beginning to become more and more diverse and the richness that it brought to our community in so many ways. We started our family in 1973, and we had three children, ultimately two boys and a girl. Our daughter and her family still live here in Orlando and our two sons, one lives in Nashville with his family, and one lives just outside of Raleigh in North Carolina in Cary, NC with his family. And we are very blessed. We have eleven grandchildren as a result of those three wonderful children and their spouses. So our oldest is in college this year and our youngest is a year and a half old. So it’s lots of fun when everybody gets together obviously. But there’s been a lot that’s happened between having those grandchildren, and Charlie and I having the three children…. My husband had been involved in a program called Leadership Orlando as a business person. And I can remember he would come home at night after going to those leadership sessions and he would say, you know, I grew up in this community, but I didn’t know that this was happening, or I didn’t know that this existed. Or, I got to meet this individual who made such an impact on our community. And so, I would listen to him share these things and I thought, gosh, I’d like to go through that program. And so, I contacted the Chamber of Commerce and they said, “Oh, I’m so sorry we only take people who are in business. We don’t take people who are involved in the business of being a volunteer.” And I, as I said, had been an Additions Volunteer. I had become involved in Junior League that does significant volunteer work in the community. I was also involved with the Volunteer Service Bureau that places volunteers with different nonprofits around the community. So I had really learned the business of volunteerism in the community. And so, I wasn’t going to take no for an answer from the Chamber. And I convinced the then President of the Chamber, Blaire Cole Pepper, I guess technically he was the Chairman of the Board, Tom Brownlee was the President of the Chamber; but I convinced Blair that they needed to start having representatives in Leadership Orlando from the volunteer community because that was an important business as well. So I became the first person to go through Leadership Orlando that was a volunteer. And also, if you look at the participants in Leadership Orlando, it’s a wonderful mix of people from the volunteer sector, from the independent sector, and business community as well. So that was kind of the beginning of trying to make a mark on the community. One of the things then that I did at the Chamber, and I’m very grateful for going through the Leadership Orlando program because I think Leadership Orlando, and going through the Junior League were really two significant involvements that made me learn about the community, but also made me want to give to the community. And so, I chaired the local government committee at the Chamber one year. And we had a new mayor, Bill Frederick, and I worked on his campaign, and I went to Bill Frederick and said, “You know, through the local government committee at the Chamber I think there are some things we may be able to do to help you in your administration.” Well, because of my involvement in Leadership Orlando, I had the opportunity to be appointed by Bill Frederick’s predecessor, Carl Langford, to the planning board, the Municipal Planning Board. And, oh, I learned so much about the community. How the community grows. How the community is planned. And we were one of the first cities in the state to really plan our community with the appropriate zoning, with appropriate land uses in different parts of the city. And I was very proud of that fact. So to be appointed to the planning board was very significant. And I realized my appointment had been because I had made some contacts with and had relationships with certain people at City Hall. So there was a patronage system so to speak that was in place. If you knew someone you had more of a chance of being appointed to one of the committees of the city. And I didn’t think that we were tapping into all of the resources of the city in the best way because of the way the system was. So I said to Bill Frederick, “Why don’t I, as Chair of the Local Government Committee at the Chamber, come up with a new methodology for appointing people to city boards and commissions.” And Bill was very open minded to that. And so, through the committee that I chaired we came up with a system that had a nominating board where people could put their name in with their resume where the nominating board could see where certain skill sets were needed for the different boards and commissions at the city and the whole process changed. And it was adopted by the city and as Chair of the Local Government Committee at the Chamber well that changed the whole system. Well, that kind of got me interested in local government in the community. And so, in 1982 at the age of 32, and as a young mother, there were some things that, you know, I thought could be done differently, you know, in my neighborhood and in the community as a whole. And I decided with a lot of encouragement from people that I would run for City Council. Now when I look back, I think, oh my goodness, what was I thinking? But, I had, had the experience in the community. I had learned about the community. I had built a network in the community. I had also, by that time, started a small business doing translation work and doing some public relations work just on my own. So I thought I can make an impact. I can make a difference. So I ran against a sixteen year incumbent at the city. And then there were two other people that also ran for the seat at the time. And I won the seat without a runoff with 76% of the vote in a four person race beating the 16 year incumbent. So here I was moving in a totally different direction now. But it was very exciting, because I knew I had a big responsibility and that the people who had elected me placed this responsibility on me and in me. But I also knew that I could make a difference. So I also knew that I served for ten years as a city commissioner representing District I and in the middle of my third four year term as city commissioner for District I had a lot of people in the community come to me and Bill Frederick decided that he was going to step down. And, I was encouraged to run for mayor at the time. So in 1992, I ran for my first of three terms, successful terms as Mayor of the City of Orlando. As a local elected official, I had a lot of opportunities both as a city commissioner and as a mayor to not only meet wonderful people in our own community and to learn from them. I think that’s the most important thing. I learned from people. Because as I would often say, “People in our neighborhoods live there 24/7.“ And, I was making decisions that would impact their lives in those neighborhoods. So if I didn’t listen to them, and if we as a city commission didn’t listen to them, we couldn’t possibly know what was happening in other neighborhoods when we weren’t there on a regular basis. But what I do miss is every day being with the people in the neighborhoods of Orlando. Or at the state level when I served as Secretary of State meeting people in neighborhoods and communities across the state because that’s what makes a community great. It’s the people. It’s not the ordinances we put in place and it’s not the decisions we make about different issues. While those impact peoples lives, it’s the people that really make a difference. And when people are treating each other with respect and there’s civility in the decision-making process from the neighborhood level on up, you’re going to have a much better community. And, I think, we’ve been pretty fortunate in our community to have that. You know, at times they’ll be issues that become a little contentious and controversial. But, I think, in the end there is a level of respect and I hope that Orlando always stays that way. Would you tell us about the Florida League of Cities and your work serving as President of the Florida League of Cities and then serving as President of the National League of Cities? One of the organizations that I was involved in from the moment I was elected city commissioner was the Florida League of Cities. And this is an organization made up of elected representatives from all the cities in Florida. And we have well over 400 cities in the state of Florida. Actually, Bill Frederick encouraged me to get involved and represent the city on the Board of the Florida League of Cities. Because we had an automatic seat being one of the ten most populous cities. So I’m very thankful that Mayor Frederick encouraged me to do that and supported me in that effort. And, it helped me learn from other cities and bring a lot of good ideas back to the city. And it gave me the opportunity to share a lot of the things that we were doing that were innovative in the City of Orlando with others. And the networks that you build, because sometimes when you’re in those seats of decision-making as an elected official it can be a bit lonely when you’re dealing with certain issues. And so, that network of other elected officials that you can talk to and learn from is very important. So, after a number of years being involved with the Florida League of Cities and being on the Board, I was elected by that body to move up through the seats and become president of the Florida League of Cities. And that was a great honor for me. And, in being President of the Florida League of Cities, I was able to visit cities all over the state and share with them different legislative issues that were impacting cities. And I was the key spokesperson, elected spokesperson for those cities with the legislature. So I spent time up in Tallahassee during the legislative session testifying before the different committees and trying to make sure that we were able to keep our home rule for cities and that different issues that were important to Florida cities were not impacted in a negative way. So that was a great honor for me as well. And again, it broadened my network, people that I knew. And the Florida League of Cities just like the other 49 states that have League of Cities also were involved in the National League of Cities. And so, when I had finished my term as President of the Florida League of Cities, they asked if they could put my name up for election to the Board of the National League of Cities. And again, a great honor. And I was elected to the Board of the National League of Cities, and then ultimately gained the confidence of people across the nation and was elected President of the National League of Cities. And so, at the national level then I became the elected spokesperson for cities across the nation. At press conferences in Washington, DC, testified before different congressional committees, represented cities at the White House in front of the President with different presentations. And again, just a wonderful way to learn, but a great honor, a huge responsibility that I had doing so. I also had the opportunity to travel to many, many states across the country to speak to their League of Cities to talk about the issues at the federal level that were impacting cities. And so, to this day I still have great friends who were mayors of other cities at the time I was Mayor of the City of Orlando, or other people who were President of the National League of Cities. In fact, were invited to come back to the meetings at the national level and so when I am able to do that even today I see a lot of those colleagues that I worked with at the National League of Cities in those different positions and its wonderful. One of my great mentors really at that level was Bill Hudnut, who was Mayor of Indianapolis, Indiana. He also served in Congress and he got me involved with an organization called the Urban Land Institute. And the Urban Land Institute is an international organization representing planners, developers, architects, have reached now more to represent people in the public sector so that there can be that learning from private to public. And the main mission of the Urban Land Institute is to make wise decisions about land use and communities. So thanks to Bill Hudnut mentoring me in many ways not only as an elected official, but to get involved in the Urban Land Institute. I now serve as a Global Trustee for the Urban Land Institute. And one of the programs that I work on with them is called the Advisory Services Program where teams of people with different skill sets and expertise are put together to go into a community that has asked for help from ULI to look at a transportation problem, a land use problem, an urban development problem, a downtown renewal issue. And so, we work in teams of usually seven to nine people. And most recently, for example, about a month ago I was in Kansas City, Missouri looking at a transportation concern that they have and I’ve chaired a number of the advisory panels. Again, taking all that knowledge that I gained all those many years into a community and trying to help them deal with an issue. But, learning from these incredible people with other skill sets and expertise that I don’t have. So it’s another great network and another great way to learn. And, I’m very grateful to the Urban Land Institute for keeping me involved with different issues that impact communities so I can stay current and learn in that way. You have received substantial recognition for your leadership regarding international economic development. You created the Metro Orlando International Affairs Council. Would you tell us about the Council and your vision for international economic development? I’ve had so many opportunities as an elected official. One of the things that I really emphasized while I was mayor and seen the changes going on in our community with new businesses coming in and then, of course, different events that were taking place. Our theme parks that were attracting people from all over the globe. And so, I thought, we need to emphasize the international impact as an economic development opportunity in our community. World Cup, for example. I happened to be mayor when World Cup was here and we hosted fans and attendees from eight different nations. But those fans and attendees as I would say were business people. And so, why not try and capitalize on the fact that we have a great business climate here in the Central Florida community, and encourage those fans from those different countries to look for partnerships for business here or open a business here. We have the business infrastructure in place. We have language skills that are here. We have a diverse population. We have everything going for us. So through the Economic Development Commission, I formed the Metro Orlando International Affairs Council and it was made up of key business people in the community as well as city, county elected officials as well. For example, with World Cup, we took a delegation from this community and visited each of the countries that were going to be represented here in the World Cup matches and we talked about business. We talked about what it was going to be like to be in Orlando for World Cup matches. But we took key business leaders to talk about opportunities and how we could set up seminars during the time that they were here and business meetings for them. And that paid off in many ways for us. And there are still businesses in place today as a result of that effort. And then we did even more through the Metro Orlando International Affairs Commission. We would take delegations on a regular basis to targeted countries around the globe where we felt we could either grow existing relationships or seize new relationships. And so, we did a lot of that. We had great participation from the media, from the theme parks, from our Conventions and Visitors Bureau, from our large businesses in the community and from our small businesses as well. So I was privileged to be able to head up a lot of those international business missions as well. And when you look across our community today, I mean, you just see the impact of the international community on us in our school system, in our business, in the plethora of Chambers of Commerce that we have representing different communities. We also at that time were able to start an honorary consular corps here in our community. Miami had really, had all the consular offices and Tampa was seizing a few kind of spinoffs from Miami. But I was determined that if we had some of those consulate offices here in Orlando that we could again have more business opportunities taken advantage of. So at one time we had, I think, up to ten consulate and honorary consulate representatives here. And we still have those that exist in our community. And that’s very helpful for travelers that are here if they’re in need of something and getting information for the business community as well. You created the Mayor’s Neighborhood Matching Grants Program to improve the quality of life in Orlando neighborhoods. Would you describe the program for us? How did it come about? During the time that I was mayor, there were some very large issues that we dealt with. You know one of the things that I really, as I mentioned before, put emphasis on were neighborhoods. And I wanted to make sure that all neighborhoods were treated equally and that all neighborhoods had an opportunity to have some amenities. And so, one of the programs that we put in place with the new office that I created through the Neighborhood Services Office was the Neighborhood Matching Grants Program. And this was where I got businesses to offer some financial support. The city put in some financial support. And neighborhoods could apply for one of those small grants, but significant for a neighborhood, that would be a way to beautify the community, put signage up for identification of their community, start a program for young people after school in the community, a variety of things. And it was a very successful grants program and there are programs very similar that continue to this day. So it’s always nice to see those things in place. We had programs that not only improved our neighborhoods, but we also had some tough issues that we had to deal with during the time that I was mayor. We saw as our community continued to grow and as we were being very deliberate in where certain land uses could be, we knew that we were going to have transportation issues that we were going to have to continue to deal with. And, I’ve also been a strong advocate of mass transit and multimodal transportation offerings in the community. And we have a good bus system. And we had during the first term in office that I had as mayor, put in place our Lymmo system downtown; our circulator that people could get from one part of downtown to another. And now, of course, it’s been expanded and will continue to be expanded. But that was to be really the beginning of that multimodal system in the community, where your bus system connecting to your downtown circulator, hopefully you would have a light rail system and then you would have a commuter rail system. And then, there’s been talk for many decades about connecting us through rail to other communities in the state, and that conversation continues today. And, of course, we have Sun Rail now in place, our commuter rail. But the one piece that’s still missing, and that we tried very hard to put in place during the time that I was mayor and also served as chairman of the Lynx organization when this debate was going on, was a light rail system. We had identified the corridor for light rail system. We had identified the funding, both federal funding and state funding that would be matched by local funding. But, you know, sometimes the timing’s just not right. And so, regretfully, we were not able to put a light rail system in place at the time. And, as a result, we’ve lost a lot of that right of way opportunity in our community. So hopefully, we will be able to expand commuter rail in some way. It may not be with a rail system, but perhaps with dedicated bus lanes that can connect it. But the only way a true multi-modal transportation system works is for the different pieces and components of it to be linked together and to connect. So we still have those conversations, but we also still love our highways as we can see with the expansion of I-4 through downtown. And, we’re going to continue to have more and more automobiles and traffic in the community because we’re a growing community. And we have those tens of millions of visitors that come to our community as well. So it’s always going to be a challenge for us. Another big challenge that presented itself to me in my first term in office which I never ever anticipated – you know, you come into office and you have worked with people in the community to come up with different ideas and plans and I had those in the housing area, and the transportation area, and the economic development area, and the neighborhood area. I put together citizen groups to help me form ideas so that when I came into office we could start working on them. But I had never ever imagined that the Naval Training Center here in Orlando that was such a wonderful partner in so many ways, not only an economic boost for us in the community, but also all the volunteer hours and initiatives that came from the people that worked there and came there to the Naval Training Center. The BRAC Commission was formed. The Base Reuse Enclosure Commission. And we had a Congressional Representative, Bill McCollum at the time sat on the BRAC Commission. And one of the bases that was up for consideration for closure was the Orlando Naval Training Center. In the first round of the BRAC hearings we were able, with Congressman McCollum’s support and help, to take that off the chopping block so to speak. In the second round the following year, unfortunately, the decision was made to close the Naval Training Center. So all of a sudden, I as mayor saw this huge economic engine and thousands of acres of land that were going to be vacated. And so, I quickly put together a Base Reuse Commission made up of business people, elected individuals from all levels of government, key players in the community that will help us to come up with a plan where we could replace that economic force that we were going to lose. And I won’t go into all the details of it because it was a long and arduous process and actually it was about a ten year process. And there were lots of public meetings. We had over 250 public meetings. We had all kinds of communications. We had all kinds of opportunities for input from the community. Because the idea was to create a new community, especially on the main base site which is now Baldwin Park; and a wonderful mixed use community where people live and work and there’s schools and peoples can recreate there and there’s the lake and it seamlessly moves from that neighborhood in Baldwin Park into the surrounding neighborhoods. And then we also had the opportunity with the land from the base that was out next to the International Airport to develop that, redevelop it, I should say, from base housing that had been there for many, many years. In fact, when I was a child, Pine Castle Air Force Base was there, McCoy Air Force Base was there and that housing was quite old. And we went through a process and had a developer come in and redevelop affordable housing, attainable housing for people and put parks in place. And, you know, we’re able to redo schools and we’re able to save some of the amenities that people in the military would come and frequent as well. So those were the two main properties that through the Base Reuse Commission we were able to readapt and reuse and, a great success story. Baldwin Park has won all the top awards from the Urban Land Institute for land use and the way it was developed and designed. And, it was a lot of time and effort by a great team of people from the community and my great staff at the City of Orlando. I spent a lot of time in Washington and at the Pentagon negotiating different details of the plan. But you can look at it now and see a wonderful neighborhood that’s been written up in many books about planning and good solid planning efforts, so I’m very proud of that. When I was in my third term as mayor, I was asked by the then governor of the state if I would consider coming up to Tallahassee and taking on the responsibilities as Secretary of State. And it was a very tough decision for me because I don’t think there’s anything more gratifying than serving at the local level of government because you’re in constant contact with those neighbors. And, you know that every decision you make is impacting every person in your community whether it’s that little child in kindergarten up to the seniors that live in our senior living communities, whether it’s our high rises downtown or if they’re able to be independent in their own homes, and our African American community, our Hispanic community, our growing Asian community. You know, I really thought long and hard. But I also recognized that I had another opportunity to serve at the state level, and to take on some new challenges. And I’ve never been afraid of taking on challenges. And, as I’ve shared with you a couple things where I feel like I can go in and convince people and negotiate through some tough issues. So I agreed. I told Governor Jeb Bush that I would come to Tallahassee. And my responsibilities included Library and Information Systems, it included corporations, it included historical resources, a lot of economic development initiatives at the state level the governor asked me to be responsible for, and it also included elections. And, of course, we all remember the election of 2000 in the State of Florida when we became kind of in the national spotlight and I recognized the fact that the 2004 presidential election would be under my watch as Secretary of State. But I was convinced that we were going to right any wrongs of the past and that we were going to run a seamless election in the state of Florida. So I spent a lot of time working with the Supervisor of Elections all across the state. And each county has their own Supervisor of Elections and they are independent and have responsibilities for their individual counties. And so, I was kind of the shepherd if you will with all the sheep of Supervisor of Elections trying to at least give them guidance to make sure that they had the tools necessary to run seamless elections in each of those counties so we wouldn’t have a problem as existed in 2000. Well, low and behold, about two to three months before the presidential primary and everything was going smoothly, everything was in place, we had four hurricanes hit the state of Florida. Many of the elections offices were destroyed or significant damage to them in counties across the state. Many of the precincts where people would go to vote in the presidential primary were no longer. Many people became dislocated as often happens when there is a hurricane in our state. And so, It was hard to find these people and let them know how they could or where they could vote. So my team at the State and I worked very hard to come up with some very creative concepts for doing super precincts where, for example, in one county in a gymnasium we had six different precincts all voting in different corners and areas of the gymnasium. To let people know where they could vote because things had changed, we actually flew planes with banners behind them to get the information out. We had to be creative. We had to get the support of the legislature to change some of the laws so that these things could be put in place. And so, I was very pleased about how we were able to run elections that year in 2004. I was spokesperson for the state when it came to elections. You know, on national news and doing all kinds of print and electronic interviews. And so, it was very challenging, exhausting. But our plan worked and it turned out that the system worked very well. A couple of the other things in the responsibility that I had at the state level that I enjoyed immensely, Cultural Affairs. I always had been an advocate for the arts in community. And, one of the things that I did as mayor in the City of Orlando, was really start hopefully kind of turning the tide and getting people to understand that the arts again is an economic generator in our community. Sports certainly are, the international impact, economic generator. But arts, look how the arts have grown in our community and how people recognize the fact that it’s a significant contributor. So at the state level, I felt that we needed to do an economic development study on arts and culture. And so, I was able to, through the private sector, secure funding. And we put in place an economic impact study for arts and culture for the State of Florida. And to this day, that study is still referenced. You can look at it online; it continues to be updated on a regular basis. I was also asked by the governor to work with Enterprise Florida which was a state public private partnership and we were going through an economic development and economic impact study at the state level as well for business. And so, I was the coauthor along with Darrell Kelley who was head of Enterprise Florida. And then Workforce Florida also worked with us on that. So that study is still in place. The Florida Chamber of Commerce uses that. Florida Chamber of Commerce is another organization that’s really had an impact on me. I was privileged to serve as the first woman president, Chairman of the Board of the Chamber of Commerce. As a small business owner, I think, I was the first small business owner, when I had my public relations business, to serve as Chairman of the Florida Chamber of Commerce. And I still remain a Board Member of the Florida Chamber. And, in fact, this year will be chairing the Small Business Council for the Chamber. So it’s kind of interesting, it’s kind of a circle that’s happened for me. But the Florida Chamber is really the voice of business and they use that economic impact study that Enterprise Florida and my office as Secretary of State and Workforce did. They use that on an ongoing basis as well. With the Library and Information Services, you know that was a great area for me because I think I was like every other library consumer. I knew what the library had been in my life. You know, I would go check out books, do research there. But I didn’t realize until I was Secretary of State and had this under my responsibility how much libraries had really changed. And I always like to say that libraries are really kind of the living room of the community that is the heart and soul of the community. Where, yes, you can still check out books, you can still do research, but you can do so much more. I mean look at our own library and all the opportunities to do things here. And, it’s a gathering place for people in the community. And so, I recognized when I visited libraries all over the state, and we were able to put in place a grants program for libraries and it was great to see how they were used. You know, some libraries put little cafes in place. Others were able to leverage some of those grant dollars that the state offered to get private sector contributions to do things. And certainly our own library here in Orlando has had tremendous support from the private sector to put in place significant gathering spaces where people can take classes and learn things. You know, recording studios and 3-D printing and all the things that I continue to learn about our own library. But we did an economic impact study for libraries in the state of Florida as well and that continues to be used across the state. The Honorable Glenda Evans Hood photographed at the Orlando Public Library on October 25, 2017. 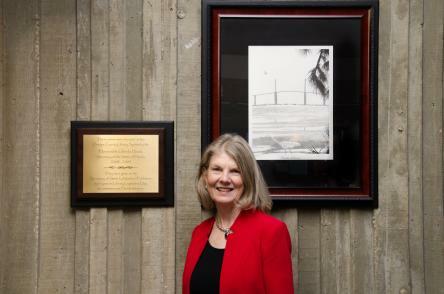 The plaque inscription reads: These prints were donated to the Orange County Library System by the Honorable Glenda Hood, Secretary of the State of Florida, 2003-2005. 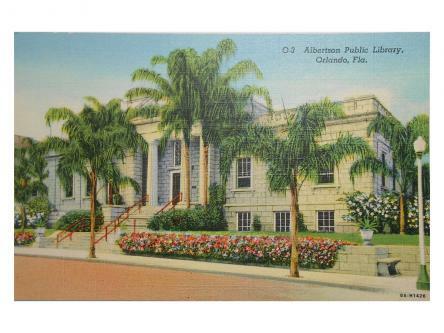 They were given to the Secretary of State by Mumford Publishers each year on Library Legislative Day to commemorate Florida libraries. It was a real honor to serve as Secretary of State. And so, I decided one of the most important things to me had always been that citizen involvement. And I saw how impactful that was and how I had depended on that as a city commissioner, as mayor, as secretary of state, even with all my nonprofit work, of course, and, as a businesswoman. And so, Shelley Lauten and I along with Steve Siebert from Tallahassee decided to form a small business called TriSect to work with the different sectors: public, private, and independent or nonprofit sectors to really look at innovative and new ways of civic engagement and community involvement. And so we worked with a lot of different organizations, and help them really look through different lenses at how you involve people, and creative ways to get people to the table talking with one another, respecting each other’s opinions, keeping that civility in the mix. And so, I think it’s kind of where I started. You know, as a young person growing up in this community and realizing by being involved and by earning the respect of other people and making an impact and a difference in small ways and in much larger ways and significant ways at the state and national level as well as the local level I wanted to help other people do the same thing. And so we had our business for several years and then we had other opportunities offered to us. Shelley went on to head up the Commission on Homelessness. And interestingly enough, that was one of the first projects we worked on was homelessness and how different communities had best practices that we could replicate here. And that was really a passion of hers. Steve Siebert who’s up in Tallahassee, continues to live there and he always had a passion for the cultural and historical aspect off our state. And certainly, I had appreciated that with the historical resources under me as Secretary of State. So he now is the Executive Director of the Florida Humanities Council and I’m a member of that and love the work that they do. And I had an opportunity and was asked to serve on several corporate boards in the healthcare industry, banking industry, and engineering and planning areas. And so, I do not only my work on a regular basis with Urban Land Institute and do some private consulting on civic engagement and strategic planning with different communities, but also serve on several corporate boards and that’s very gratifying as well. So it’s always amazing how all the skill sets you’ve learned in so many different ways in your community have given you an opportunity to grow and expand and do new things. And one of the things that when I look at our community of Orlando now, as I said earlier, I mean, we’re growing, we’re changing, we’re transitioning in many ways and, I think, we’ve done it in a very cordial way and in a way that hasn’t turned different patrons of the community against one another. I think we worked together very well and my hope and desire is that’s always where we’re held up as a best practice in that way. I think we’re going to continue to be challenged by transportation needs in the community. I think we’re going to be continually challenged with, you know, education needs. Our school system is one of the largest in the nation and going to continue to grow. And we’re going to have needs there and we want to make sure that our young people are being educated so that they can not only take on responsibilities in our community, but so that they can excel beyond our community as well. Our economy is strong right now and we’re certainly taking advantage of that. But we have to be cautious. And we have to make sure that we’re planning our community in the appropriate way so that we don’t have a problem if there’s a dip in the economy again. You know one great asset that we have is our University of Central Florida and with the presence that they have in our community in so many ways. And they’re going to have a major downtown presence with the Creative Village. So I think that there’s many opportunities ahead of us in this community and I’m very hopeful that we’ll continue to seize them in the best way possible. Do you still see Orlando as the City Beautiful? I think we are the City Beautiful and I don’t want us to forget that. Because there was a time I can remember as mayor people would say, “Do we still use that? The City Beautiful?” And I said, “I do. But I’m not sure we’re using it as much as we should.” So we started making sure that we went back to that City Beautiful Movement. And it was a movement across our country decades ago where cities would protect their green spaces. They’d look at their parks and waterways and lakes and streams as assets in their community, make them accessible to everybody in the community and that was what the City Beautiful Movement was all about. We want to be Orlando unique and we want to guard and protect those things. And, as you know, with my ULI work I go into many cities and communities and that’s what they’re emphasizing now. We want to be the City Beautiful. We want to make sure this movement continues. So for Orlando, we need to continue to emphasize that. We need to continue to protect those assets that we have and realize that we can grow and we can seize on opportunities and present certain things without taking away the things that mean so much to us and that make us unique. Because we don’t want to be like anybody else. We want to be Orlando unique and we want to guard and protect those things. Getting back to the most important asset we have is our people and how we care about one another. And we’ve seen that with tragedies that we’ve had in our community; how people come together. Certainly with the Pulse tragedy our community became one. We learn from things like that. Hurricanes, tornadoes, all those things bring us together and that’s what makes us the City Beautiful as far as I’m concerned. You know as an elected official, I think one of the things I have always thought about is not only the great opportunities that I had to meet people and to work with people and to learn from people, but my children also had the opportunity to learn about their community in ways that a lot of young people don’t get a chance to. But I would always make sure if I was asked to go to one of their classrooms to speak or to speak at some ceremony at their school, I would check with them first because I didn’t want to invade their personal life. I wanted to make sure that they lived as normal a life as possible even though I told them you’re really not going to be treated like everybody else. And that could be good or bad, but at the same time I wanted to make sure that they wanted me there. And so, I’ll never forget I went to my oldest sons 7 am class, a history class at Boone one morning. I had asked him if I could come and he said, “Yes, that would be all right if you came and spoke to the class, but mom I have two rules.” And I said, “What are those, Monty?” And he said, “Well, number one, don’t tell them you’re my mother. And, number two, don’t be boring.” And, I thought, oh my goodness, now these are going to be challenging. I walked into the classroom, I did not refer to him at all. I didn’t say, “Hey, my son Monty’s in your class.” The teacher introduced me and as she introduced me she said, “Monty, would you like to introduce your mother or would you like me to?” So number one rule, gone. So, 7 am in the morning, teenagers are not exactly engaged. So I tried to be very engaging and I tend to move around a lot and talk with my hands and be very energetic. And so, I thought by the end of the class that I had done a fairly decent job and had awakened many of the students from their sleep that early in the morning. And, I looked back at my son and he gave me a big thumbs up. And so, I thought, hooray, I accomplished that. So my children were exposed to a lot of things in different ways. When my youngest son graduated from Boone I was the commencement speaker. And again, I checked with him to make sure that it would be all right and he was the one of our three children that really liked politics and really liked doing things. In fact, I had him introduce me for one of my state of the city speeches one time. And he thought that was the greatest thing ever. He got a chance to meet a lot of interesting people. Arnold Schwarzenegger on his birthday, for example, and things like that. But he also, along with our daughter and our oldest son, respected the fact that a community is a very delicate organization. And a community works in certain ways and I think they gained great appreciation for that as a result of my being in public office. So there are very humbling times that you get from your children and your grandchildren. But again, I’ve gone to my grandchildren’s classes and spoken and, I think, one of the greatest thrills I’ve always had is going into the schools and talking to the children. And I kind of approach government – because it’s hard for a first grader, for example to understand how government works – so I kind of start with well, so you wake up in the morning and you brush your teeth and you turn on the water and where does the water come from? Who is responsible for that? And you get in the car with your parents to drive to school or maybe you ride your bicycle and what do you go on? You go on a road. And who builds those roads? So I try to relate it to the different age of the child. One question that I always get when I would go into an elementary school classroom, there would be someone raising their hand furiously wanting to be called on and I would call on them and their question would be, “Mayor Hood, did you come here in a limousine?” And, my answer was always, “No, I’m sorry, I just came in a blue Buick.” And they were a bit disappointed. I don’t think they were quite as impressed with a mayor that didn’t come in a limousine. Glenda: You know, there’s funny stories and there’s serious stories. And again, it’s a great thing to be able to influence people in this way. My own and others. Jane: And you’re inspiring the future. I’m sure one of them will probably be in public office. Glenda: I hope so. And one of the things that I had was Mayor’s Youth Council. You’re helping me remember a lot of things now. And we would, or the school would select two students from each high school and each middle school to serve on the Mayor’s Youth Council. And we would meet on a regular basis and they would learn different things about the City of Orlando government and how it worked. And they would attend different events, volunteer to do different things. Every once and a while I’ll be somewhere and someone will come up to me and say, “Mayor Hood, I’m so and so, I served on your Youth Council.” And, in fact, there’s one young man that I email on a regular basis who served on my Youth Council who’s now doing some great things in his life after serving in the military. And so, it’s very gratifying to know that perhaps you’ve had an influence in some way. Not just by the example you’ve set in how you’ve handled yourself in a professional way and dealt with issues, some much more challenging than others. But, hopefully you’ve been civil and respectful and listened, but in the end know that you have to draw the line and make a tough decision. But when you know that you’ve hopefully made a difference in people’s lives and hopefully made your community better. And, you’ve built on the past. As I said, we’ve been very fortunate in this community to have good leadership. And so, I think every administration builds on the next one and we can’t forget that. And, we can’t erase what those different chapters in the life and the history of our community and our city are. Glenda Evans on the "Uncle Walt Show"
Oral history interview with the Honorable Glenda Evans Hood at the Orlando Public Library on October 25, 2017.